Out-of-Hand Observations 1: Fashion Friendly or Faux Pas? The world feeds your eyes. Daily. Every eighty six thousand four hundred seconds of a day. Shut eye or glaring vision included. There are so many things to see. I notice countless sightings at airports, on the street, at the gym, in cafeterias, at events, in elevators, on twitter, on the internet, outside the window… Poets and lyricists and writers, myself included, have so often documented the simplistic elements in beautiful prose, and continue to ignite thoughts via words inspired by daily sightings. Yet, on a different parallel, so much trend watching happens on the go, and rarely goes documented. Television, magazine and cosmopolitan cities are bursting with informatics, which although addictive like glue, are very pale in comparison to the lens of our eyes and the matrices of our mind. What we see for ourselves is often more powerful than what is shown to us. Given a bustling world with calenders squirming under the multi-layered series of events and appointments and meetings to attend, it is often difficult to document every single interesting sighting. Can anything effectively document a daily diary of disjointed trends, let alone attempt to place them in a thematic umbrella? To a certain degree, twitter enables this sharing, but with a waterfall of tweets hitting me daily, not to mention Twitter’s infamous downtimes, a more effective way of sharing trends needs to be developed. And so begins a series of out-of-hand observations, with an attempt to scoop them by levels of wackiness, theme, or any other common thread I deem appropriate. Some of these will surely rise above observations and become inspirations for designers and shoppers alike. As with every list, the consistent element here will be that of TEN (10) ITEMS per chronicle. This series will be my tribute to epitomize the love-it-hate-it-you-cannot-ignore-it phrase, primarily in arenas of fashion and accessories. We have had the polka dots of the 70s, that have infiltrated scarves and dresses and ties and shirts and socks and sarees in the 2000s. We have had the dramatic flares of the 60s that came back in the late 90s. We have had the skinnys of the 80s that are back as an urban trend in present times. And there have been the iconic aviators and gigantic glares that have been in vogue again for the past few years. But sometimes, we crave something different. Something offbeat. Such uniqueness slowly begins to transcend through our imagination and into a sphere of something quirky, weird, strange, and ultimately just bizarre. Some laud such fashion as creative, others loathe it as impractical. Yet, the one thread that binds all these iconic observations is their inspiration from something which is diametrically opposite to them. Just like the cringe inducing words of the otherwise tasty wasabi ice cream, we have ten products that take inspiration from something that they are definitely not. Taking inspiration from a lady’s mandatory companion, the lipstick, Italian designer Alberto Guardiani fuses this with a woman’s other passion, shoes. I spotted a lady wearing these at an airport no less. Naturally they attracted immense attraction, from men either baffled or intrigued by her personality and imaginary professional life, or women who were in awe of the whimsical fantasy of it all. A quick note of the overwhelmingly loud conversation that penetrated my atrocious Ipod earphones told me that this was a relatively pricey, somewhat rare, and offbeat creation, along with legitimate fears that a scruffed heel tip and lip applicator would not look very appealing. I have already spoken of the varieties of fragrances and personal care products that look like they belong more in a grocery aisle than a beauty counter. This compares to a series of Demeter Fragrances with ironic scents of Funeral Home, Jelly Belly Fruit Salad and Ginseng Root! 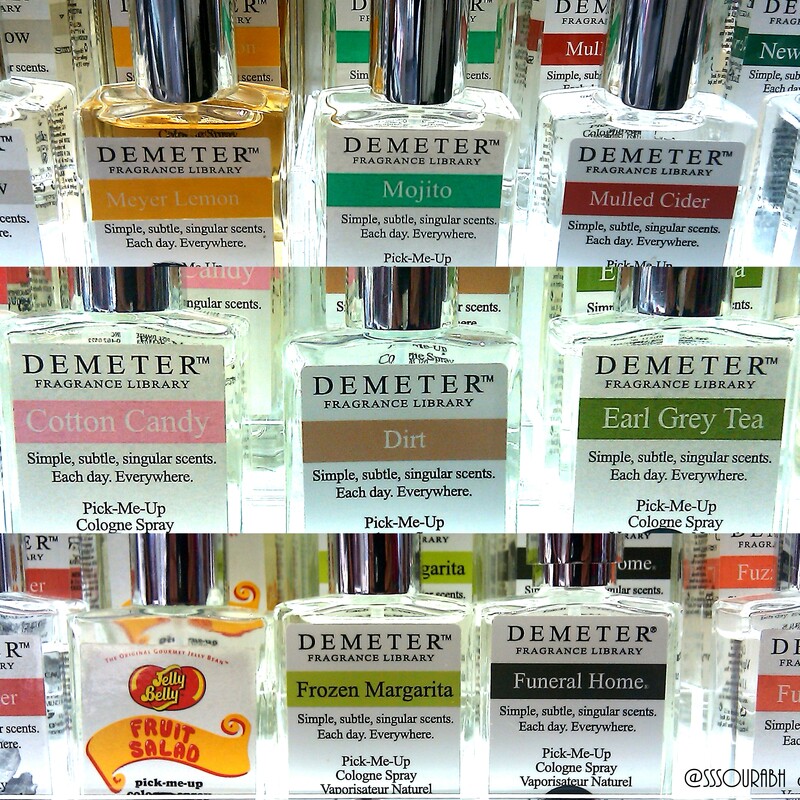 The smart move here is that Demeter markets these miniatures as evocative and single experience fragrances; thankfully so since a full size bottle of something called Dirt would possibly not match the rest of one’s dresser. The juxtaposed clash of these – placed altogether with the same packaging too, and in such populated varieties no less – is readily available in many department stores. 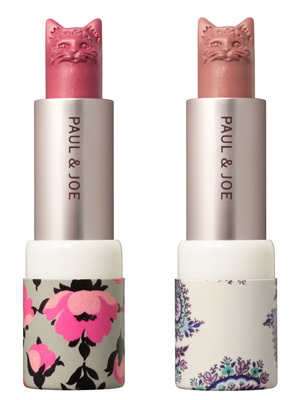 PETA may want to object here with the symbolic reference to having a cat shaped lipstick by the otherwise creative Paul and Joe cosmetics line, which is however quite fashionably relevant to French cosmetics. Although creative and uniquely (if not strangely) inspired to sway from the ordinary in the indistinguishably clone-like lipstick market, it baffles me on a few levels. How often does a lady keep her lipstick up and out in the open? Since these are the only times one can admire the waxy features on this cat. Admittedly, it can look enchanting on a mirrored shelf, an SLR photograph or when whisked out of a clutch by a radiant woman; but my second qualm is that it may not look good upon repeated usage. Even with one use, or a few at that, a languishing ear, eye, mouthless morphed cat is simply a nightmarish view to see, particularly in the process of being caked onto a woman’s lips! Cor Sine Labe Doli’s accessories were introduced to me by a friend, owing to their distinctness and clean appeal. The flagship product is a ceramic papillion, with an elaborate creation process, a signature of Italian accessory designers. Classically these are made of fabric, so the solidified inspiration is indeed sizzling in buzz. However, keeping their neat prettiness aside, such solid and delicate bowties are inevitably going to land up in splinters when yanked off by us guys at the end of a tumultuous night. Wooden ones may fare better, except for when a guy has to look down to do a number of things, or perhaps when a lady must lean on her guy’s chest only to be hit by this blob of wood. And metal… well, this is getting to look too much like unfavorably constructed weaponary, though the sheen polish heightens the glam quotient. It is however, an intriguing to look at when its wearer stands stationary. I love all things ice cream. And I love the way ice cream is diversifying into so many arenas. But I will not tolerate a lady wearing these, for a fear of what else she would be wearing, and would most positively smile in sheer horror if she had the same colored scoops in her hands. Admittedly I did not see these live, but was shown them on someone’s phone whilst standing in a relentlessly long line to buy chocolate. It shed light on some humorous waiting-in-line conversations, though, with many favoring the indulgent look. With a childish mind for pranks, I would be tempted to yank the cone-cloned heels on a tired afternoon, and guarantee the thought passes through the minds of several under-five year olds too. The credit for these goes to the yuppy and creative Oyee Design of Turkey, who have developed several women’s shoes in a rather creative way that truly emphasize the derriere… of the shoe that is. Flowers are whimsically inspiring or subtly uplifting, and having visited Keukenhof, the world’s most photographed place and flower haven, I can vouch for the variety of thoughts they so aptly evoke. Floral garlands evoke the image of an Indian wedding, or when placed more simply and ethereally, a nymph in the woods. However, to wear them oneself? 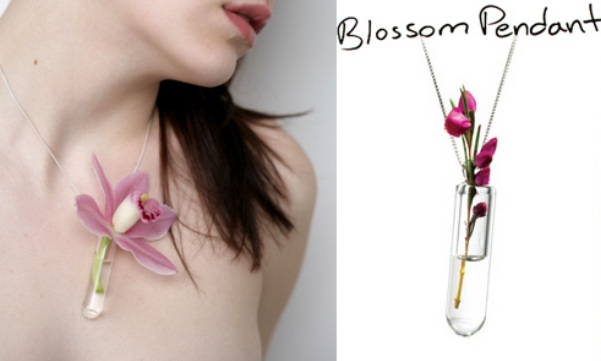 Rockettoro has created glass vials akin to Chemistry lab test tubes, laced on a silvery necklace that enable the wearer to adorn a flower of their choice, albeit dipped in a spoonful of water! Having not seen these in person but via reference from a jewelry designer, I can concoct innumerable scenarios that spell chaos for the wearer. Standing-water-bacterial-playground aside, I can visualize this splashing and splattering (not to mention the vial potentially splintering so close to the heart), causing more damage by awkwardly positioned wetspots on the chest area. A cute idea, but perhaps more appropriate for occasion where ladies have to retain a rigid posture, or perhaps even remain motionless! Lord Shiva wrapped a snake around his neck, not as a scarf but as a garland, as a symbol of wisdom. 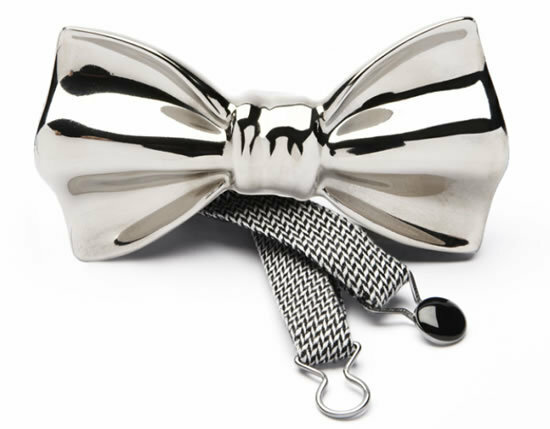 I am not sure if that was the inspiration for the menswear line Jaspare, which was brought to my attention by a fashion forward acquaintance during fashion week, but from seeing the evocative textures and prints of this men’s accessory line, I felt it most apt to align a relationship. 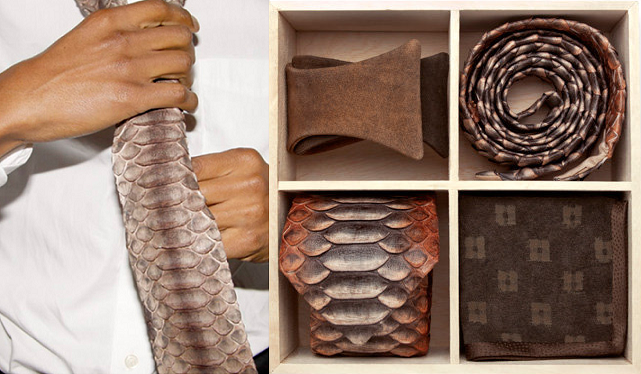 Although some find it eerie, I was quite impressed by the independent label’s selection of ties, pocket squares, and many accessories made from python, leather, and other materials, a combination of concepts from Missouri and New York. Weird, but well applied, for a change, especially since we are so used to having ties being made of the same old silk, whilst our shirts and jackets and belts have diversified greatly in terms of fabric and material. Ponies: a little girl’s favorite playtime passtime. Sashays of long tresses that are now seemingly a bit gross, what with toys having evolutionized from play pals to laptops. Not to forget the weird ponies with colored tails. Reputed Masaya Kushino of Japan has taken inspiration from these for her pony styled shoe range, which when alone looks like a piece of art. Complimenting the horsetails with gigantic wooden soles allows the deaf to imagine a pony trotting down the aisle. But whilst one can exude endless commentary on these, one clear fact is that they do not look too wearable – I can only imagine the tripping hazards, the grotesque look of those locks when the walker steps in mud or water, or the inevitable pitfall if the fibers are sucked into an escalator. The Japanese cobbler is most certainly talented, visible from her catwalk creations in couture shows worldwide, but still shows up on this list of visually surprising chronicles! Being so very familiar with Indian customs, I always find a bride with rich, dark chocolatey colored mehndi in intricate designs all the way up to her elbows quite attractive. With that said it does not necessarily gel well when you see this recent bride donning the designs and finery on a bikini-clad beachy honeymoon, but in the traditional setting there is something very sensual about a jewelry decker. The hands draw attention due to the ornate jewelery that clutches the rings and ties them to thick encrusted bangles with snaking strings of gold. 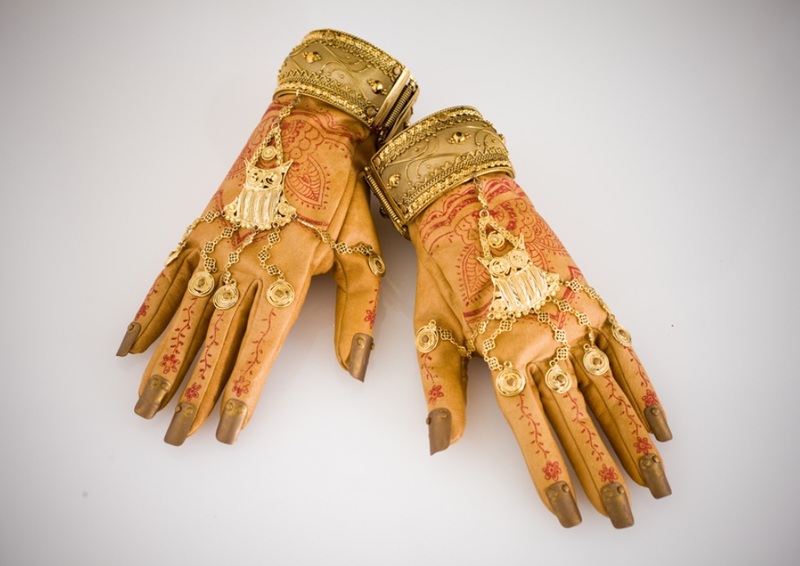 Great for a wedding, or even a dance festival, but as an inspiration to create hand-like gloves? I saw these at a show, and immediately looked them up to see quite a few counterparts available, alarmed by the creativity but every so slightly cringing by the vaguely ghoulish appearance. Masaya Kushino shows her creativity once again! These would starkly clash with the pale mono-colored non-gaudy outfits of the west, but I think they would work marvelously for those Indians living in cold climates of Vancouver or Oslo or Helsinki, wishing to have something festive to wear with their finery that is so often hiding under thick wooly coats. And of course we have the countless women of a Passion Mindset who would make this their choice of the season. If Masaya Kushino could create artificial hand replicas, Rei Kawakubo‘s Japanese label Comme des Garcons can go a step further and paint toes on manly looking women’s shoes, can’t they? This is globalization at its best: a shoe that was spotted in a store in London, with a Japanese label holding a French name that strips gender barriers, not only with its English translation but with a shoe that is for women, looks like it is for men, but has women’s toenails painted on it. Phew! Definitely a quirky collection, courtesy of designer Rei Kawakubo, which seems to relay a message of comfort, albeit in a rather strange way. And this comfortable, neo-fashionable item is priced rather highly for what it is, in the 800 USD range. Having being introduced to these by a fashion forward acquaintance, the inevitable discussion that ensued was that the price alone influences inexpensive ripoffs, and a plain style that virtually demands do-it-yourself (DIY) antics! And thus concludes a sharing of some strange fashion ideas, thoughts, blunders and phobias that have come my way, grouped here by ones that have been inspired by items other than what they fundamentally represent. And so ends the first chapter in a series of chronicles of things I see around me that definitely make my neck jerk by repeated flicks of checking them out twice. These are in categories of food, fashion, and yes frameworks too, given that frameworks often embody people. All you have to do is turn on your true senses behind your open eyes. So, always look around (even if it is with clever subtlety, like from behind a pair of glasses or sunglasses). The world has a lot to feed your eyes. To be honest – I would like to buy most of those things. 😉 Especially the lipstick shoes. Haha some of them are quite cool! I’m not saying they’re outright bizarre to not purchase, but they definitely require a stylish person to carry them of with confidence. I’m glad you liked them, this is part 1 of a series of chronicles that I’m going to document on offbeat fashion items! 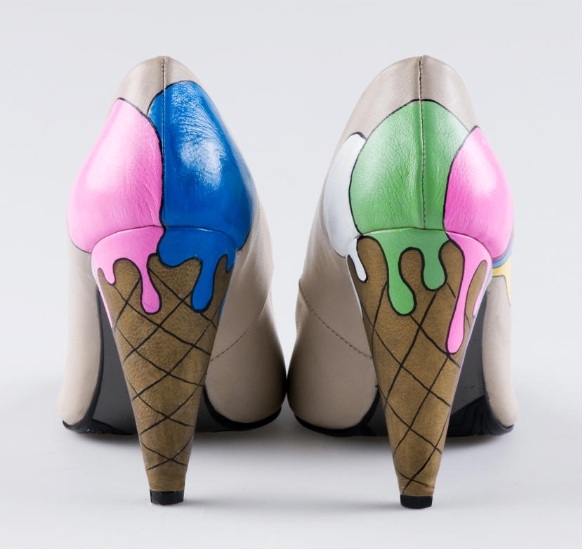 I must say, I love the lipstick and ice cream heels! However, that’s from the perspective of an utter heels addict, who quite often peruses ifshoescouldkill.com, which is supposed to be filled with ridiculous heels, and horrifies herself by wanting some of them. So I may be somewhat biased. Wow, thanks for reminding me of ifshoescouldkill.com, that will definitely feature in my next chronicle of offbeat fashion items! I had come across it a while back, but now will reference it and you for when I post up my next episode :). The ice cream ones are definitely quite sane, relative to some of the others, and as you can see from the poll, are the ones that people find least bizarre! Thanks for the pointer, and looking forward to connect! 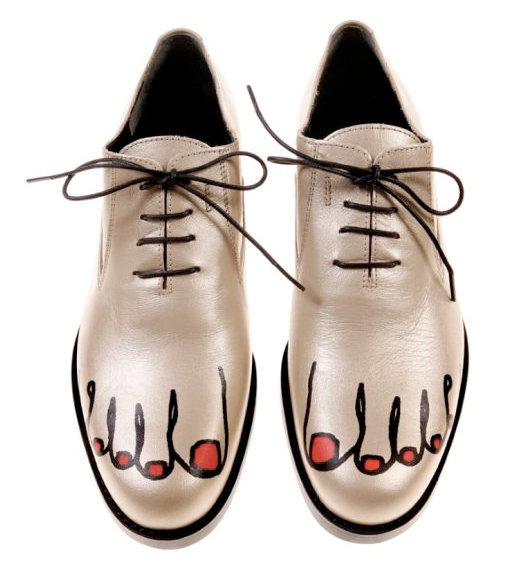 I would have worn the lipstick heels 10 years ago; I would wear the toenail men shoes now. I’ll be waiting for someone to make a knockoff. If you search the brand name or type red toe shoes or the like, you’ll see several blogs with DIY procedures. Its kind of funny and sad all at once, since it really is a shoe that could very easily be aped more cost effectively!